I have known George since the 1980s when I belonged to the TAC II caucus and we shared office space with Substance newspaper on East Van Buren Street. Bob Healey (CTU President) belonged to the original TAC caucus, which I believe eventually became the United Progressive caucus (UPC). We spent many hours proofreading the large white sheets with blue china pencils. I believe the sheets were produced on a Mergenthaler machine. In those days, Substance was a monthly printed newspaper that was sold in the schools. 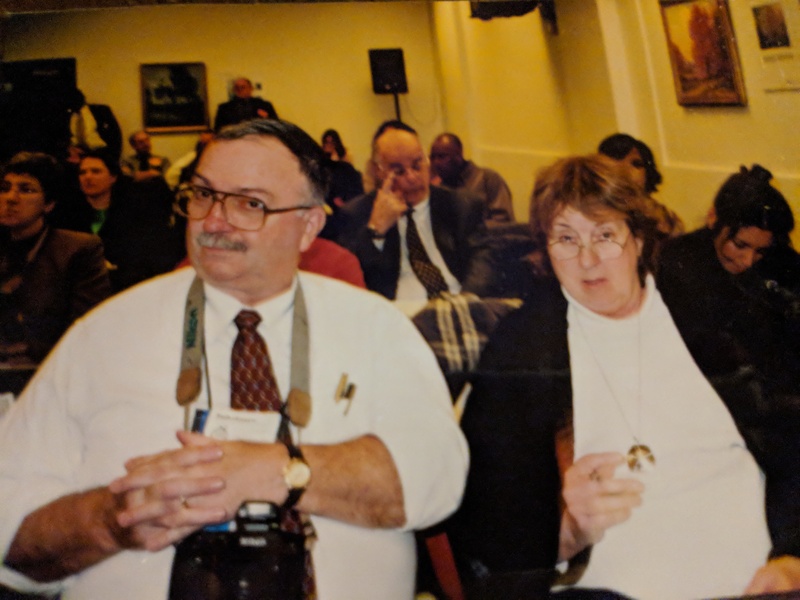 George Schmidt and Marybeth Foley covering one of the monthly Chicago Board of Education meetings in 2015.George always stressed accuracy, but he also wanted us to check for the substance of the article as well as spelling, grammar or typos. George and Leo always celebrated with Jack Daniels or Wild Turkey when the paper was finally “put to bed." Many people belonged to Substance: Harold Harris, Dorothy Pearson, Dan Van Zile, Christine Johnson, Allegra Podrovsky, Terry Czernak Leo Gorenstein, Larry McDonald, James Daniels, Louis Pyster, Gerald Rudnik and many others. We later moved our office to Harrison and Wells, and much later to a store front on Irving Park Road, and finally to George’s home on Berteau Avenue. George held monthly meetings of Substance until he got sick this summer. At the meetings he went around the group and listened to us tell what was happening at our schools or in the system and asking us what we would be writing about. He generously provided donuts, bagels, coffee, and fruit at every meeting. He would always ask halfway through the meeting if anyone wanted more coffee and then, if needed, he would make another pot. George shared stories of his experiences in the system, his family history including his parents service in World War II, his experiences during the 60s when he opposed the war in Vietnam, remarks about the Civil War, and comments about the many books he was always reading. One of the most significant series he wrote about was the expose of James Moffat, principal at Kelvyn Park High School, who was convicted for child molestation. He also printed the CASE tests. For that he was sued, but wasn't found liable for any money damages. George was one of the smartest people I have known, He expected us to work hard, but he always worked harder than any of us. He was a prolific writer. The words just flowed from his fingertips. Most of all, he was a family man, a loving husband and father. It is hard to believe he is no longer with us, but his memory will live on in our hearts and minds. He has left a wonderful legacy. Marybeth, Your article shared a lot of inside info about Substance, that was a long history of you knowing him. Substance is a monthly investigative newspaper devoted to in-depth reporting on the major issues facing public education. Our mission is to report facts and provide interpretations of the news about public schools unhindered by the biases against public education that currently infest both the “liberal” left and the “conservative” right. We are also pro-union, pro-child, and pro-democracy. Because of this, the news stories in Substance provide accurate information but never maintain the pretense of “objectivity.” “Objectivity” as it is practiced by the major media in this case means slanting the news to reflect the biases of the millionaire and billionaire individuals and corporations that control the public’s access to news and information. As much as I thought I knew about the history of Substance, Marybeth, I thank you for reminding me of so much. You also cover a time where my husband Jim was more involved in George's campaigns than I was. Happy to be reminded of all the different times. I also thank John Kugler because it's through him we're reminded of what now it's become the vogue to call "the mission statement," in this case, of Substance. I love the way George spoke here of the falseness of objectivity, today often referred to as a false equivalency, as if all views have equal merit, weight, and truth.